We've re-imagined how you use Flipboard on the phone and built it around those passions that define your work, life and play. At the heart of Flipboard 4 is a powerful new capability: Smart Magazines which can be deeply personalized for the things you are most passionate about so that you can see the best stories being curated by editors, influencers and other enthusiasts who share that passion. With over 30 million magazines created, thousands of publishers on our platform, and tens of thousands of topics—plus input from social networks like Twitter, YouTube and LinkedIn—it was time for a more organized (yet still beautiful) Flipboard. Long-time readers who follow lots of content should find a more streamlined experience, while new users will be able to dive right in with minimal setup. Whoever you are, or whatever you're into, Flipboard 4 organizes the world's stories by passion. + When you open Flipboard, swipe left to pick your passion, and we'll create a Smart Magazine for each. Dynamically updated and wholly personalizable according to your interests, Smart Magazines blend expert voices, curated sources, and recommended stories to create a beautiful, easy way to keep up on all the news around your passions. + New Custom Magazines. Create a personal or group magazine where you can add handpicked stories, or make a magazine that updates automatically with content from any source, person, publication or even Twitter hashtag. + Your new Home carousel houses up to nine of your favorite magazines. 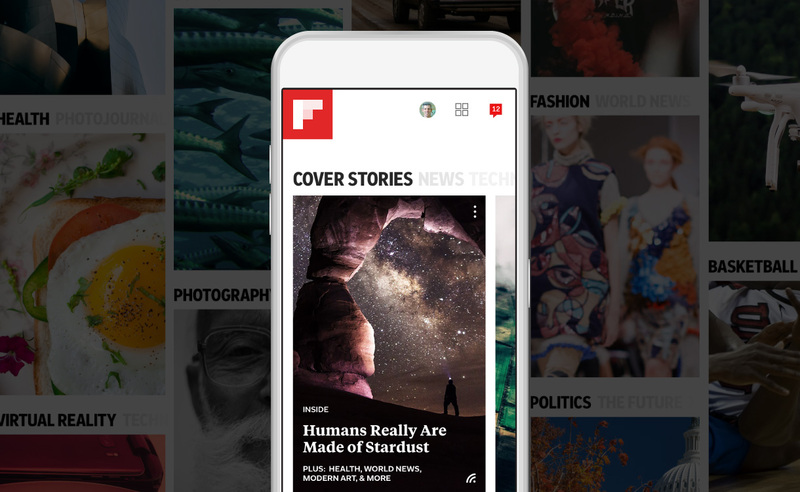 Your profile hosts everything else you're following on Flipboard. + The more you interact with Flipboard, the better your experience will be: the algorithm learns from what you follow, heart and add. Liking great content helps your friends and followers, too, as those stories are more likely to surface to them.